LONDON (VIP NEWS) — AEG`s British Summer Time in Hyde Park sold a total of 260,000 ticket sales across all of the festival`s gigs in 2015. The figure includes sold out headline shows from Taylor Swift and The Who. 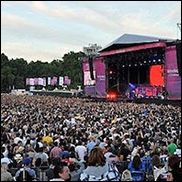 Other artists who played BST Hyde Park in 2015 include The Strokes, Blur, Kylie, Grace Jones, Paul Weller and Nile Rodgers.